As you know, I've been kicking open all kinds of new doors in my life and in the process I'm starting to see who my true friends are. My family and I live 325 miles from our nearest relatives. It's not always easy being so far from "home". Many of you know what I mean. We no longer live in the same town as our closest relatives due to military moves, job opportunities, etc. And in the absence of family, you learn to count on friends for support, guidance, and as role models for our children when their aunts, uncles and grandparents live elsewhere. I'm lucky because I have some very good friends. True friends. The kind of friends who drive two hours in torrential rain to support your dream. The kind of friends who call to wish you luck on a new venture. Friends who even though they can't make it, tell me they're thinking of me. Friends who ask questions, show genuine interest, and share in my joy. I also find it amazing that I've developed new friendships through this blog with women who share the same dreams. I've been lucky enough to meet a couple of them, like Cassie and LuLu, in person. (In fact, both of them drove great distances to come to the sale this weekend!) We're there to support each other, nudge each other out of our comfort zones and cheer each other from the sidelines. To the friends who have supported me, (new, old and bloggers) I thank you. Molly and I worked hard today filling in our space at Chartreuse and Co., in anticipation of this weekend's monthly barn sale. Here's a sneak peek of some of what we're offering! 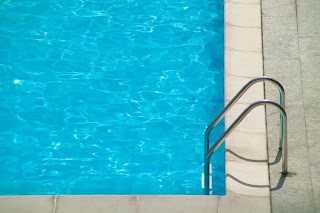 Today is the first day of the kids' summer vacation. We started it off just right. Nothing but pool time and frozen icees. As you know, my friend Molly and I have started a new venture at Chartreuse and Co., in Buckeystown, Maryland. We'll be selling vintage finds, furniture, repurposed pieces, architectural salvage, and Molly's fabulous jewelry and original and graphically produced art. Tell me what you think of our new name! A couple of posts ago I wrote about a new door that was opening to me and I wasn't sure if I should go through it or close it and walk away. Like most women I know I have the usual responsibilities: wife, mother, volunteer, job, etc. Plus with two boys, ages 13 and 10, and a airline pilot/military reservist husband who is not often home, I have a pretty full plate! So, piling on something else seemed a little daunting! If you've been reading this blog for awhile then you already know about the barn sale I joined a few months ago. It was a dream come true for me and I absolutely love everything about it. The only problem is we only have shows twice a year. I had so much fun with the first two I did, I didn't want to stop. I really love doing The Barn Show and can't wait for the next one, but that won't be until October. So in the meantime, a door cracked open. 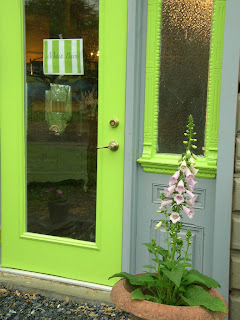 A really fabulous chartreuse colored door as a matter of fact! And guess what? I opened the door and stepped inside! My friend Molly and I just signed on to be dealers at Chartreuse and Co.. It's a really cool, old dairy barn, that's been in the owner's family since 1942. The cows are long gone and the barn is now home to a monthly tag sale the third weekend of every month. I first stumbled on the barn in January and absolutely fell in love with what Virginia, the owner, and the rest of the dealers were creating there every month. It truly is amazing! So in addition to the twice yearly barn shows I'll still be doing, I'll also be living out my dream on a monthly basis in an entirely different location, about an hour's drive from my home. My plate definitely just got fuller, but I figure if I'm doing something I love, it will all work out. Besides, clean houses, balanced meals, and weedless gardens are really over-rated.